For over 500 years the town of Gragnano, in the region of Campania, has been a stronghold of pasta production in Italy. Where there were once over 300 producers, now a dozen “pastifici” carry forward the tradition of creating this staple food that people from all over the world love and crave. 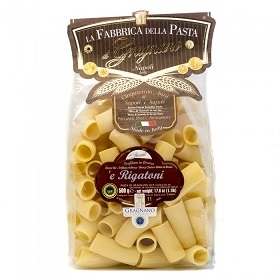 With a variety of unique and beautiful cuts (including the “world's largest pasta” - a giant shell to stuff and bake to your heart's content), La Fabbrica della Pasta di Gragnano can be enjoyed with every imaginable type of sauce. Aged Balsamic Vinegar Acetaia Dodi Il Buon Condimento - 250ml Callipo Solid Light Tuna in Olive Oil - 7oz jar Italian Country Mix Olives 1lb Tartuflanghe Black Summer Truffle Cream 30gr.